University of California Press, 9780520208230, 728pp. This study is the first of its kind: a street-level inside account of what Stalinism meant to the masses of ordinary people who lived it. Stephen Kotkin was the first American in 45 years to be allowed into Magnitogorsk, a city built in response to Stalin's decision to transform the predominantly agricultural nation into a "country of metal." 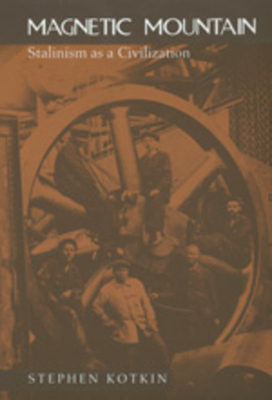 With unique access to previously untapped archives and interviews, Kotkin forges a vivid and compelling account of the impact of industrialization on a single urban community. Kotkin argues that Stalinism offered itself as an opportunity for enlightenment. The utopia it proffered, socialism, would be a new civilization based on the repudiation of capitalism. The extent to which the citizenry participated in this scheme and the relationship of the state's ambitions to the dreams of ordinary people form the substance of this fascinating story. Kotkin tells it deftly, with a remarkable understanding of the social and political system, as well as a keen instinct for the details of everyday life. Kotkin depicts a whole range of life: from the blast furnace workers who labored in the enormous iron and steel plant, to the families who struggled with the shortage of housing and services. Thematically organized and closely focused, Magnetic Mountain signals the beginning of a new stage in the writing of Soviet social history. Stephen Kotkin is Assistant Professor of History at Princeton University and author of Steeltown, USSR (California, 1991).